Piwik has some advantages as compared to Google Analytics, such as the generation of real time web analytics reports, your own web analytics data stays on your server and is not shared with third parties such as Google, additional plugins to extend functionality and a big online community of users. As already mentioned this website traffic analysis script that gives you detailed information about the visitors on your website is completely free and open source, and you can use one installation to track the visitors you get on multiple websites. So you can forget the need to use Google Analytics anymore as you will have faster and better solution, running on your own website, more customizable and expendable and absolutely free. Now you are probably going to start with the way more affordable shared hosting solutions being offered by Certified Hosting and they come in three different flavors called: DORK, GEEK and NERD. The prices below are for payments on a monthly basis, if you pay for a year or two ahead you can get quite nice discounts and you should definitely do that. 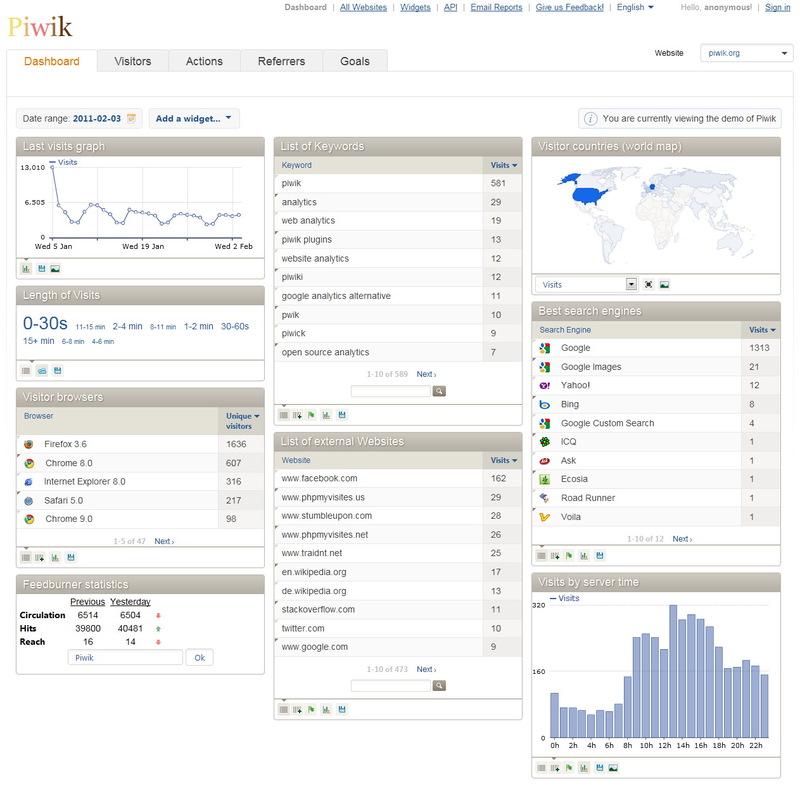 – The DORK hosting is the cheapest at $8.95 per month, but allows you to host only 1 domain on it. Of course you get unlimited monthly bandwidth and storage space, but the CPU time you can use with your website is still limited and when your blog or website gets really popular you’ll have to upgrade. – The GEEK plan is a bit more expensive at $9.95 per month, but also gives you the ability to host unlimited number of websites along with the normal unlimited bandwidth and hosting space. Again limited CPU time usage on the server so even if you host a lot of less popular websites or blogs their combined load on the server may reach the limit and you’ll need to upgrade. 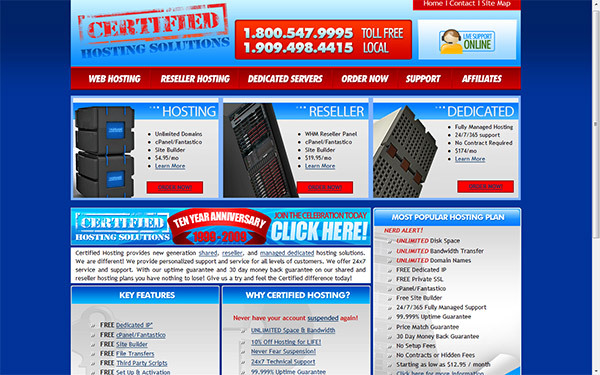 – The NERD shared hosting plan is the top one that will cost you $14.95 per month. It is like the GEEK plan, but with an additional dedicated IP address and a private SSL certificate to access your blog over a secure web connection. You can also setup an anonymous FTP account only in this hosting plan. Besides the unlimited bandwidth and space you get the above three shared hosting plans also come with unlimited FTP accounts, POP3 and IMAP emails, email forwarders and autoresponders, unlimited parked domains, subdomains and MySQL databases. You also get CGI-BIN and SSI (Server Side Includes) support, Frontpage Extensions, PHP 5, Ruby on Rails (RoR), Perl, Python, Image Magik, SSH Access, Spam Assassin Protection, Web File Manager, Cpanel Control Panel and much more. That combined with a great uptime, support and a 30 Day Money Back Guarantee definitely makes Certified Hosting a great place to host your blogs and websites. The dedicated server hosting solutions start from $99 a month and scale up depending on the hardware resources you’ll be needing, but that will be needed only when your blog becomes very popular and receives thousands of visitors per day. You can pay for your shared and dedicated hosting at Certified Hosting with any major credit card or trough PayPal or Google Checkout. The Disk Storage you get when signing up for hosting with DreamHost is unlimited as well as the Monthly Bandwidth you get, even the number of MySQL 5 databases is unlimited for your account. But the unlimited things don’t end up with just that, you also get unlimited number of: E-Mail Accounts (POP or IMAP), Full Shell and FTP Users, Domains and Subdomains Hosted and Forwarded/Mirrored domains. It would’ve been just perfect if you also didn’t have a limited CPU time you can use, but unfortunately you don’t get that and although it is normal for such low price if needed you can upgrade your account with more features. As your blog or multiple blogs become more and more popular and require more resources you can upgrade your hosting account to Virtual Private Server and get some reserved resources just for you. These include more CPU time and RAM just for your needs and you can even get an additional MySQL private server if your websites rely on too intensive database usage. And now for the price you’ll have to pay for a hosting account at DreamHost. Now here is something that you should always have in mind and that is you should not get a monthly account! I don’t recommend monthly payment, because then you’ll have to pay $10.95 every month along with $49.95 set up fee which makes the hosting a bit expensive at first. The best idea is to pay your hosting for a year in advance thus not having to pay any set up fees and your fee will go down to $9.95 per month or $119.4 for the whole year. You can also pay for 3 years in advance with $7.95 monthly, for 5 years of hosting with $6.95 monthly or even for 10 whole years with $5.95 a month.